Fluke has combined its advanced data logging Multimeter with Trendcapture with the i400 AC Current Clamp. Together they provide the ability to troubleshoot most industrial problems. 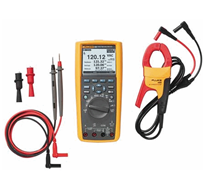 Additionally, the Fluke-289/IMSK Industrial Multimeter Service Combo Kit represents a significant savings over buying the items separately. Large 50,000 count, ¼ VGA display with white backlight.